My dear client, Becky, sent me this question about family storage in the entry way. She has a charming vintage cottage that is full of character but short on transition spaces. I am looking at getting some hooks for the entry way by our front door. We need to hang the kid’s backpacks low and our coats up high. It’s not ideal to have them facing you when you open the front door, but I don’t have a better solution (like a mud room!) What do you suggest? Small homes demand creative storage and using vertical space (that means walls) is a sensible solution. Even though hanging all your business by the front door seems like a decorating faux pas, it’s actually very practical. At the least, you can choose the most unique, attractive hooks possible and tidy up the area when company comes over. On a day to day basis, convenience will outweigh convention. The second, less obvious option, is to buy individual hooks that can be placed anywhere you please. This gives you the chance to place the exact number of hooks exactly where you need them. You also have the freedom to mix and match decorative hooks to really personalize the look. 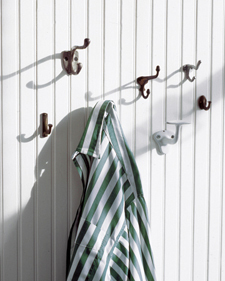 Vintage coat hooks can be found at antique stores, garage sales, and E-bay. You can use old and new hooks or simple and fancy hooks on the same wall. I think it’s more interesting to have a mismatched selection of hooks anyway. On my post tomorrow, I’ll highlight some examples and sources for hooks that are both classic and unique. Bringing it all together, here’s a casual but multifunctional arrangement for an entryway. The shelf provides space for collectibles, bowls of keys and change, hats, outgoing library books, etc. The wood pegs allow flexibility for hanging just about anything anywhere. 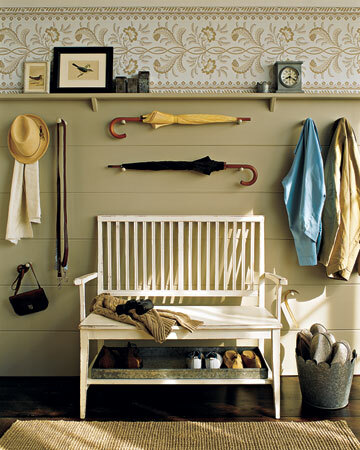 If you have space, a bench or even a stool is nice and shoe storage in a basket or tray is even handier. However, if like Becky,you only have one little wall and about 3 square feet of floor, a few hooks will do just fine.